Habit: Perennial herb to shrub. Stem: generally +- white, glabrous or hairy. Leaf: all cauline, alternate, entire or toothed; midrib white. Inflorescence: heads radiate, 1, sessile or peduncled; involucre bell-shaped or hemispheric; phyllaries graduated in 3--6 series; receptacle convex, epaleate. Ray Flower: generally 12--60; corolla white to blue or purple. Disk Flower: 30--140; corolla yellow; style tips linear, acute. Fruit: linear to club-shaped, weakly compressed, 4-ribbed, with long, +- appressed hairs; pappus of 30--45, unequal, barbed bristles. Habit: Shrub <= 1.5 m. Stem: generally glabrous (rarely puberulent proximal to heads). Leaf: 2--6 cm, oblanceolate to oblong or lanceolate, obtuse or acute at tip, +- spiny-dentate or entire, not much reduced distally on stem, glabrous or margins sparsely hairy. Inflorescence: heads sessile (or peduncle <= 11 cm); phyllaries 5--20 mm, 1.5--3.5 mm wide, +- glabrous, innermost >= immediately preceding series. Ray Flower: 25--40; tube 4--6 mm; ray 1.2--3.2 cm, lavender or light blue. Disk Flower: 55--140; corolla 8--10.5 mm. Fruit: 3--4 mm; pappus bristles <= 12 mm. Chromosomes: 2n=12. 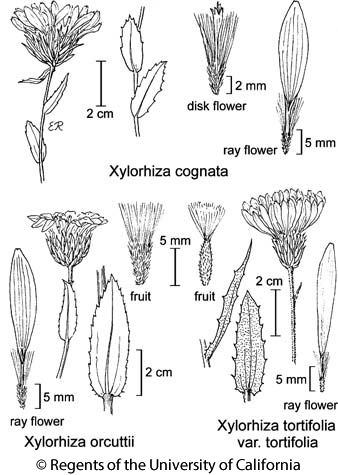 Citation for this treatment: David J. Keil 2012, Xylorhiza orcuttii, in Jepson Flora Project (eds.) Jepson eFlora, http://ucjeps.berkeley.edu/eflora/eflora_display.php?tid=5636, accessed on April 24, 2019.
s DSon. Markers link to CCH specimen records. Yellow markers indicate records that may provide evidence for eFlora range revision or may have georeferencing or identification issues. Purple markers indicate specimens collected from a garden, greenhouse, or other non-wild location.